Professional standard Dual Tip Brush Pens, perfect for hobbyists and artists alike! Dual Tip - The large, durable & flexible tip allow for a variety of strokes. Creating broad or thin lines, or even smooth transitions between the two, is super natural and easy. The pens are pressure sensitive to give accurate control to the artist. The other end features a fineliner tip perfect for fine details. Watercolor Effects - Our ink has been specially designed to allow for blending with water on appropriate paper surfaces (watercolor pads work best). We have sourced our ink from Germany to bring only the best to our customers. Use water with a paintbrush, or for added convenience use MozArt Water Brush Pens, for smooth highlighting, shadowing and blending effects. Premium grade - Our aim is to release high quality art products for affordable prices, perfect for professional artists and hobbyists alike. We source top quality inks from Germany and ensure ink is non-toxic and conforms to ASTM standards. 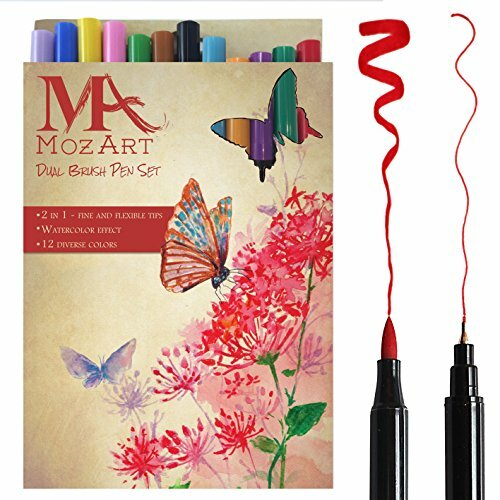 MozArt Brush Pens (along with our whole range) make very memorable and appreciated gifts on any occasion whether it is Christmas, Thanksgiving, Birthdays, Graduations or simply going back to school. Versatility - MozArt Brush pens are perfect to use for countless artistic activities. The soft tip makes it very suitable for calligraphy and lettering, the vibrant color selection and the rich pigment of the ink make it perfect for eye catching drawings, coloring books and manga, and lightweight and convenient for general sketching or scrapbooking. Satisfaction Guaranteed - MozArt Supplies prides itself on the high quality of its products. Customer satisfaction is very important to us, so please contact us if you have any issues or are unhappy with the product and we will guarantee a resolution. TWIN TIPS - These dual brush pen markers features a large, durable & flexible tip to allow for a variety of strokes ranging from thick to thin, and a fineliner point tip perfect for fine details - Combine the two to create countless effects and really bring your artwork to life! VERSATILE - These dual brush markers feature a vibrant color selection for coloring books, bullet journaling, scrapbook, and manga drawings, flexible tip for calligraphy and lettering, perfect for scrapbooking and card making, and much more!